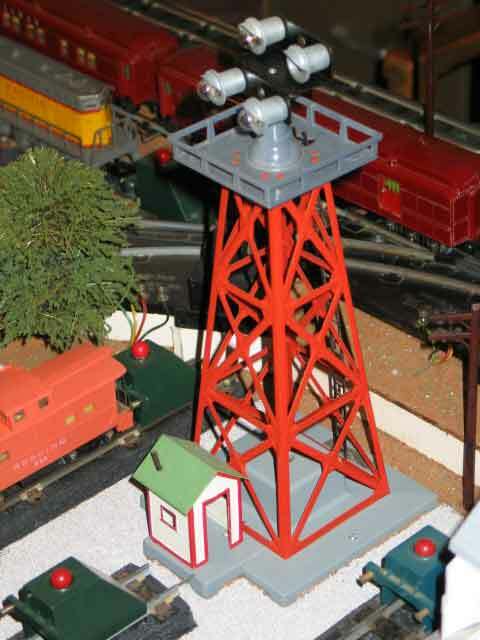 Because some of the Buildings & Towers (like those on this page) are also operating accessories, they are shown in both places. 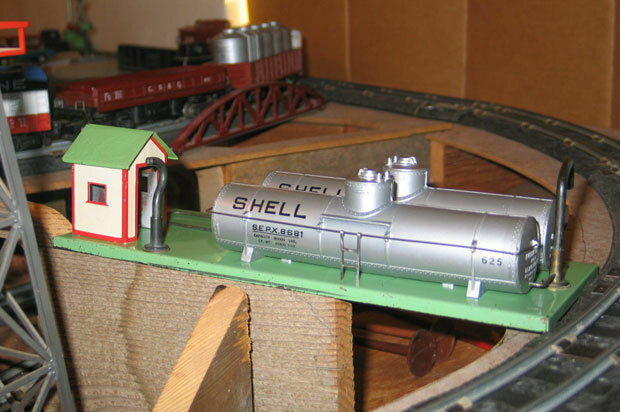 #768 Oil Supply Depot with Shell tanks made in 1950. 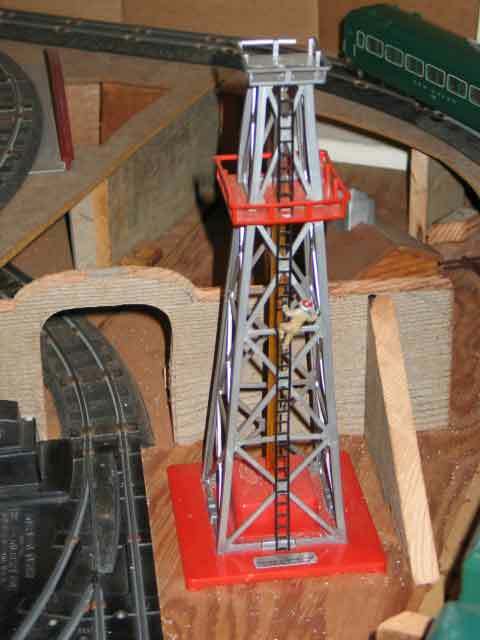 It's going to go right there in the last unlandscaped corner of my layout. 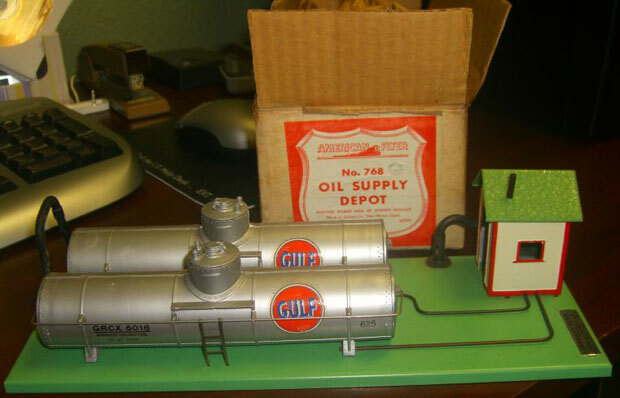 #768G Oil Supply Depot with Gulf tanks made in 1951 thru 1953. 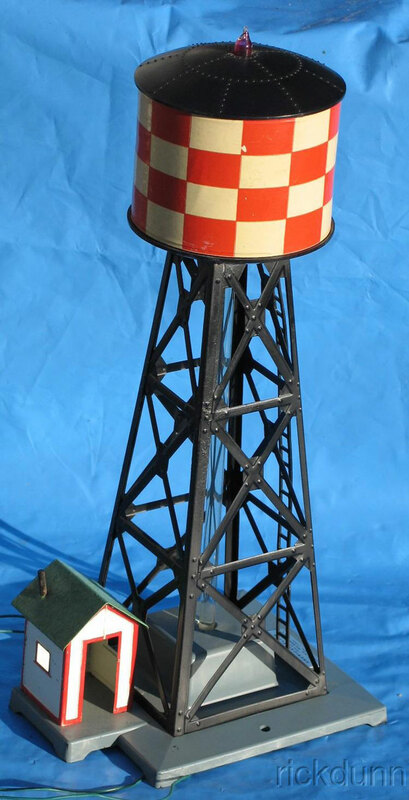 #769 plastic Aircraft Beacon made in 1950. There were several variations. #769A sheet metal Aircraft Beacon made in 1951 thru 1957. There were several variations: gray or dark gray-painted tower. Colber also produced several much less valuable versions of the #769A. #771 Stockyard made in 1950-1954. 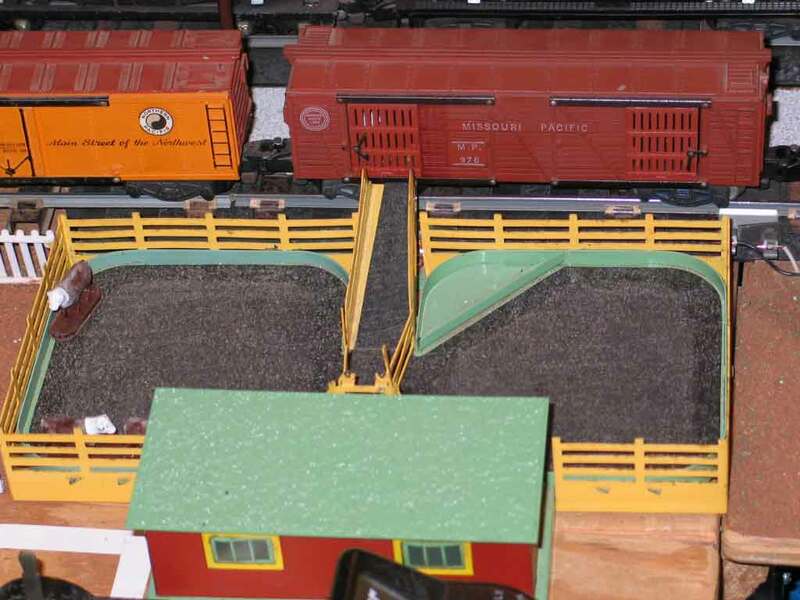 It was sold as a set with the #736 Operating Stock Car. when you open the gate. They leave the car through the other door after a ride around the layout. #K771 Stockyard made in 1953-1956. It is the same as #771 but was sold with the #976 Operating Stock Car. #772 plastic Water Tower built for A. C. Gilbert by Colber from 1950 thru 1952. 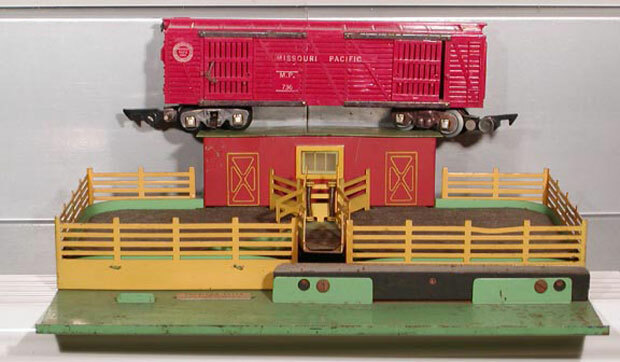 It was also made with a red base and a red or gray tank from 1950 thru 1952. Colber made a dark green plastic version that they sold under their own name. #772 Water Tower with checkerboard tank made in 1953 thru 1957. 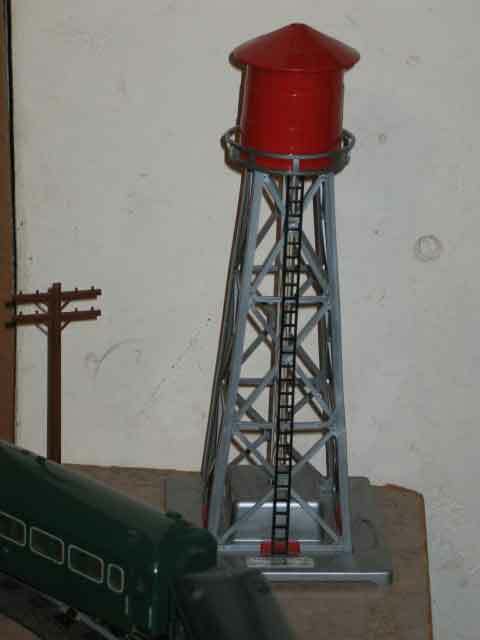 It had a gray or green base and black or dark gray sheet metal tower. but it quickly became #23772. The only way to tell the difference is to have the original box it came in. 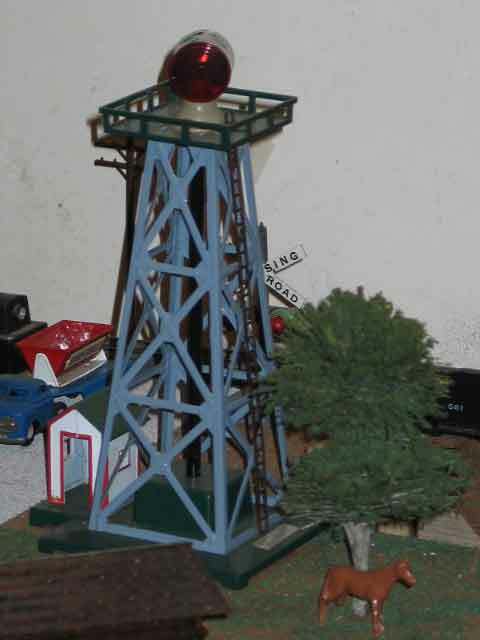 #773 Oil Derrick made in 1950 thru 1952. 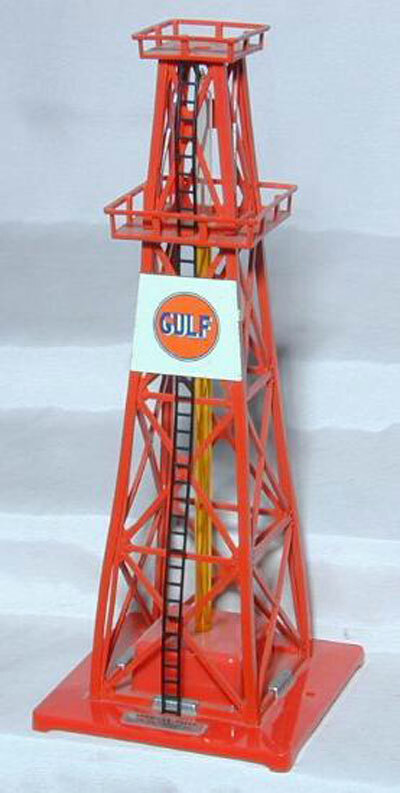 An extremely rare variation bore the Gulf Oil logo. #774 Floodlight Tower made in 1951 & 1952.
four lights with black or silver sockets in each corner. There were many variations. Some towers came with a workman with wrench like the #773 Oil Derick above. 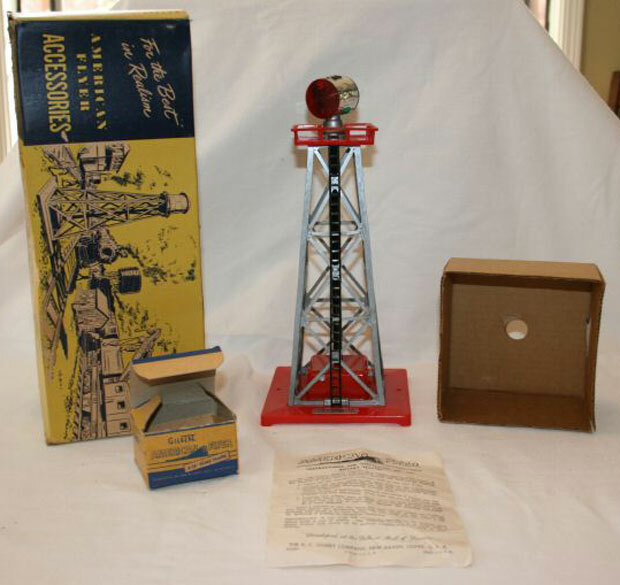 #774 Floodlight Tower made in 1953 thru 1957.
four die-cast light housings all pointing in the same direction. There were several variations, especially in catwalk colors. Show me the rest of the Buildings.